In 2014 Israel resumed its practice of carrying out punitive home demolitions in the West Bank and East Jerusalem, after refraining from using this method almost entirely during the preceding decade. Since July 2014, the military has demolished 54 homes either completely or partially. Over 300 people had lived in the demolished homes. The declared goal of punitive home demolitions is to deter potential assailants, by harming the relatives of Palestinians who have committed attacks against Israelis or are suspected of doing so. But in practice, innocent people are harmed as a matter of official policy, the effectivity of which is highly questionable even according to Israel itself. 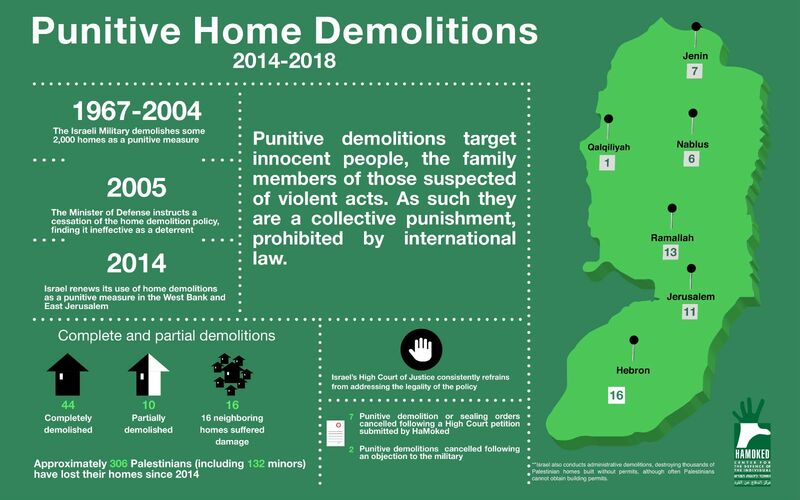 Home demolitions do not replace criminal punishment; in most cases, the people to whom the attacks are attributed are either imprisoned or killed. Those most harmed by punitive home demolitions are the residents of the demolished homes, who are not suspected of any wrongdoing. It is therefore evident that home demolitions constitute collective punishment, contrary to international law and to the basic principle in every legal system (including Israeli law) according to which a person cannot be punished for acts he or she did not commit.